Money Morning Resource Specialist Peter Krauth has good news for precious metal investors: The price of gold could start climbing and reach $1,300 an ounce if the Fed raises rates on June 14. From today's gold price of $1,270.70 per ounce, that's a modest gain of 2.3%. "Early next week, we could see some more sideways movement leading up to the outcome of the FOMC meeting on June 14. And that may well be the trigger to send gold past the $1,300 mark," Krauth said on June 9. If gold prices hit $1,300 per ounce, the precious metal will be up 8.56% year to date. In comparison, an index fund tracking the Dow Jones Industrial Average is up just 7.63%. 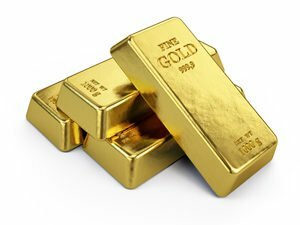 However, Krauth expects gold prices to keep climbing once the price hits $1,300 an ounce. His bold gold price prediction for the end of 2017 shows even more market-beating gains. In addition to that new gold price prediction, we also have a bonus profit opportunity in the gold mining stock sector for readers today. In theory, gold prices should fall if the Fed raises rates. Parking cash in a savings account when interest rates are higher can provide better returns than owning gold, which doesn't offer a yield. Also, gold is priced in U.S. dollars, and buying of the dollar can increase after a Fed rate hike. Money becomes more expensive to borrow with higher rates, making it scarcer and its buying capacity more powerful because of supply and demand. Gold then becomes more expensive for foreign investors, which can drive down demand. Less demand can then lead to falling prices for precious metals. Gold prices actually climbed after the Fed raised rates in March 2017. On March 15, gold traded for $1,198.80 per ounce. Less than two weeks later, gold was trading for $1,257.55 per ounce on March 27. That's an increase of 4.9%. Many wealthy investors and large institutions use profits from other investments to buy gold. "When an upcoming Fed rate hike becomes highly anticipated, deep-pocketed speculators go long on the dollar and, conversely, short gold," editor Brien Lundin of Gold Newsletter told MarketWatch on March 15. After the rate hike, Lundin also said these large investors then sell the dollar and buy gold, which provides portfolio protection. The March rate hike was a bullish endorsement for the economy, but the Fed's tone was still conservative. The Fed still projected GDP growth of just 2.1% for 2017 and 2018. In comparison, GDP growth was 2.4% in 2014 and 2.6% in 2015. If the Fed can't stick to its plan of three rate hikes in 2017 and GDP growth falls short of even modest expectations, that could cause a sell-off in stocks. Gold prices could then climb because of volatile market conditions. "I think a clear and sustained break above $1,300 will help kick off a new rally in gold prices," Krauth said on June 9.